Squadra, the designer and manufacturer of Squadra custom gear and the licensee of Castelli custom gear for North America will be at booth 836 at the Sea Otter Expo. "Once a year we hold a sample sale and this year we have decided to do this at Sea Otter," quoted Greg Demgen, VP of Sales and Marketing for Squadra, Inc. "We will also have some very good values on basic training gear." Items will be priced at 50% of cost! We encourage customers and interested parties to come on by and meet us. Many custom customers never get a chance to meet the people in the company they buy from. We will have Dave and Tom, our 2 founders and owners there as well as Dave Thile and Greg Demgen that run the sales efforts. People can also stop on by and just get the current catalog of our 2007 custom gear. "Squadra at booth 836...why wouldn't ya!!!!!" 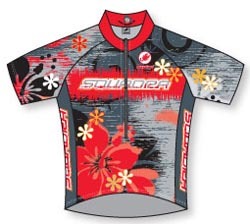 Founded in 1996, Squadra Inc. is a leading technical manufacturer of custom cycling, triathlon and golf apparel based in Carlsbad, Calif. Squadra holds the license for Castelli branded custom apparel distribution for North America.